1000+ Flash animations built-in to the program. 10 Flash video players + skins. MP3 music player. hundreds of backgrounds Flash buttons The Screen saver Maker V2.2 provides an easy way to create your own screensavers. Simply select the objects and drag into place. All objects can be resized and placed anywhere on the screen. 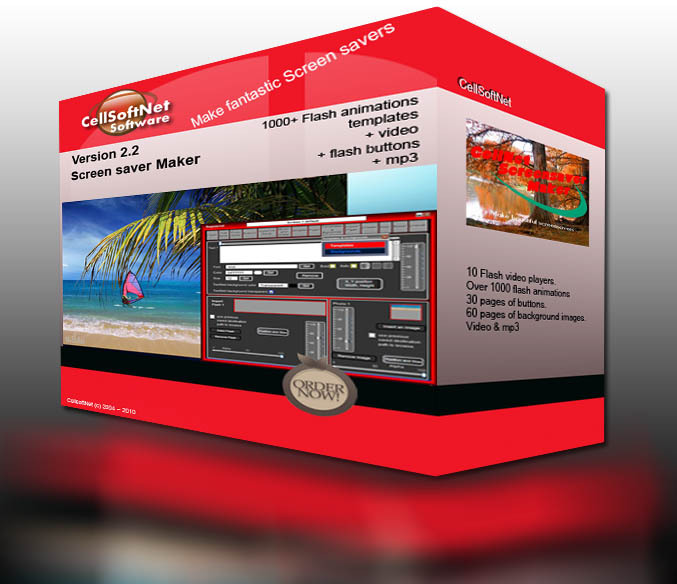 It is easy to build a fully customizable screen saver with your own photos and hundreds of built in flash effects, backgrounds, sounds, and even buttons and hyperlinks. A list of Flash Video and mp3 music can easily be added. Other options include being able to install the screensaver, create and copy the files to a folder or screensavers files can be compressed and added to a ZIP with an independent installer/uninstaller. You are free to distribute and sell the screensavers generated.